A superior trap set. The doom of many unprepared PCs await. This premium set is based upon Gary Gygax's 1st edition D&D module "Tomb of Horrors." It was a virtual death-trap for PCs. (DM evil grin goes here.) 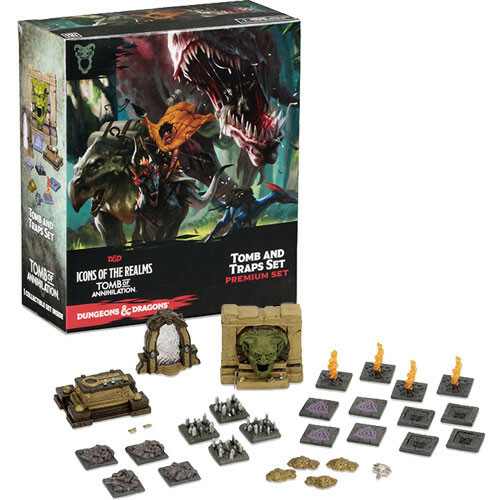 These minis are great to use for that game or the 5th edition update: Tomb of Annihilation. You can find trap minis produced by other manufactures cheaper, but this set's pre-painted traps are top-notch and worth the cost. The gargoyle-face mini is iconic D&D and looks great on my gaming table. Both the Sarcophagus and the Archway Portal beckon curious players to their doom. The Demilich Skull, potions, and scrolls are a bit small and difficult to handle, but I haven't a solution to keeping them in place on my game table. My only minor complaint is that the Sword of Sharpness does not look as nice as the art on the back of the box...but it will have to do.